Whatever your reasons may be for wanting to design or remodel a home office, the space should ultimately be a place that you like to spend time. 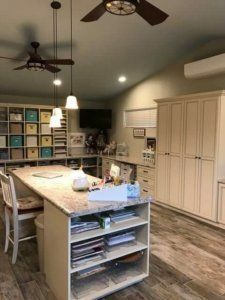 Before getting started with your home office remodeling plans, it is important to make a clear distinction regarding the boundaries of your home workspace. Will clients or colleagues be visiting you in your home office? What kind of materials will you need to store or file? Do you need to invest in any office equipment or furniture? Which specific hours of the day will you be doing the bulk of your work? Home Office: Should I Use a Rarely Used Room, or Create a New Space? Perhaps there is a room in your home that you currently do not use very often which you can repurpose into a great home office with a few adjustments or updates. For example, you may be able to transform a guest room you only use a couple of times a year or another rarely used area, such as an attic or playroom, into your office. Keep in mind that a home office is an investment that can provide a good return such as allowing you to work more productively and efficiently. Before you set your initial budget, you need to create a list of priorities for your home office remodel. For instance, do you need extra storage space for specific items like work files or office supplies? Will you need specialized cable or data lines, or separate business phone lines? Is more than one person going to be working in the space? Do you need a separate area to conduct business with clients? When you develop your plans for your home office remodel, make sure you envision yourself working comfortably in the finished space. After spending time designing your new home office, adding a desk, a few filing cabinets, and a chair will not make the best use of the design. With a custom layout, you can keep things organized and make the space more comfortable. To create the best organization, consider including cabinetry, built-in bookshelves, and custom furniture that caters to your specific work needs. A contractor can build bookcases that are both functional and visually appealing. Additionally, consider installing counters along walls with cabinetry beneath or above them for storing items like supplies, paper, and other office-related essentials. Aside from cabinetry, you also may want to include a specially-designed display area to showcase personal items like pottery, photos, or awards and trophies. These cases can include lighting that offers artistic interest to the room, as well. When it comes to a work area, innovative workstation solutions are transforming the look of the modern home office. In fact, the traditional “computer desk” and “chair” are no longer necessary. Today’s technology equipment is sleeker, slimmer and easier to access from any location. Your design team can offer innovative ideas about how to create an area that suits the way you work. Consider adding windows to increase natural light that floods your new workspace. A skylight that allows natural sunlight to brighten the room can make all the difference regarding your motivation and energy levels. Listening to your kids make noise, your dog bark, or even sounds from a loud TV or radio might reduce your productivity. If you think noise will be a potential issue in your new home office, ask your remodeling contractor to install sound absorbing materials on both interior and exterior walls to reduce the impact of any noise. The bottom line: remodel your home office into something you will enjoy. Change the floors, the paint, the furniture, and design it the way you like. After all, if you are happy in your new space, your productivity will increase. If you are considering a home office remodel, the first step is to find an expert to help. With some creativity and imaginative ideas, the team at Republic West Remodeling can help you create a great home office. Our team focuses on finding unique solutions to fit your specific workspace needs. We will work with you to create a custom layout and strategic arrangements, such as incorporating built-in or hidden storage areas. By maximizing the use of your available space, we can create a home office perfectly designed with your needs in mind. Ready to take the next step? Contact us to schedule your free, no-obligation professional home office remodel consultation with one of our team members today.